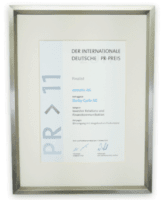 Grünwald, November 20, 2018 – Dermapharm Holding SE (“Dermapharm”), a leading manufacturer of patent-free branded pharmaceuticals for select therapeutic areas in Germany with a growing international presence, published its business figures for the first nine months of 2018 today. The company increased its sales in the reporting period by 22.7% to EUR 429.0 million (previous year: EUR 349.7 million). Earnings before interest, taxes, depreciation and amortization (EBITDA) adjusted for one-time expenses in connection with the IPO and the acquisitions of Strathmann and Trommsdorff in the amount of EUR 3.8 million rose by 28.3% to EUR 106.4 million (prior-year period: EUR 82.9 million). This resulted in an adjusted EBITDA margin of 24.8%, 1.2 percentage points above the margin of the previous year. Unadjusted EBITDA amounted to EUR 102.6 million and the unadjusted EBITDA margin was 23.9%. Both the “Branded Pharmaceuticals and Other Healthcare Products” segment and the “Parallel Import Business” segment contributed to this successful development. The acquisitions of Strathmann and Trommsdorff and additional products such as Myopridin®, Keltican® and Tromcardin® enabled Dermapharm to ideally complement its portfolio. The company’s broad positioning enables it to further reduce its dependence on direct health insurance discounts and significantly increase the share of products in the self-pay segment in select niche markets. Dermapharm was also able to gain market share in the new therapeutic area of pain treatment. In addition, Dermapharm succeeded in strengthening its position in the domestic market for the hyperthermal medical products bite away® and Herpotherm® by expanding into the pharmacy market and gaining contractual partners in Northern, Eastern and Central Europe. Dermapharm now plans to sell these products in the UK, Western Europe, Asia and the United States. Dermapharm’s comprehensive three-pillar strategy of in-house product development, internationalization and targeted M&A activities continues to bear fruit. Sales in the “Branded Pharmaceuticals and Other Healthcare Products” segment increased by 52.5% to EUR 249.5 million (previous year: EUR 163.6 million). The segment’s reported EBITDA increased by 26.5% to EUR 98.3 million (prior-year period: EUR 77.7 million). This increase was mainly due to the positive development of gross profit along with reducing expenses for discounts from direct contracts with health insurance funds and reducing the cost of materials ratio. The acquisitions of the Strathmann Group (January 1, 2018) and the Trommsdorff Group (February 1, 2018) were included in the consolidation of this business segment for the first time. As a result of the adjustment for one-time expenses in connection with the IPO and the two acquisitions, the segment’s adjusted EBITDA margin of 40.9% was below the corresponding prior-year figure of 47.5%. In the “Parallel Import Business” segment, revenue decreased by 3.6% to EUR 179.5 million in the reporting period (previous year: EUR 186.1 million). This decline was mainly due to the concentration on high-margin, small-volume preparations. With this selective approach, EBITDA in the parallel import business increased significantly by 51.6% to EUR 7.8 million in the first nine months of the year (previous year: EUR 5.2 million). Dermapharm increased its EBITDA margin in this segment from 2.8% in the same period of the previous year to 4.4% through the optimization of the product portfolio, the increase in the gross profit margin through demand-oriented purchasing and continuous cost optimization through the in-house relocation of the business with reimported narcotics. The Management Board confirms its forecast for fiscal year 2018 in light of the strategic orientation in the “Branded Pharmaceuticals and Other Healthcare Products” segment, the consistent implementation of the three-pillar strategy, the continuing stable legal situation and a steadily growing importable pharmaceutical market. The Management Board continues to expect the Group to grow in 2018 over the previous year. It continues to expect consolidated revenue 20% to 25% and EBITDA 22% to 27% higher than in fiscal year 2017. The complete 9-Month Report for 2018 is available online as of today at ir.dermapharm.com. Dermapharm is a leading manufacturer of patent-free branded pharmaceuticals for selected markets in Germany. Founded in 1991, the company is based in Grünwald near Munich and has its main manufacturing facility in Brehna near Leipzig. The company’s integrated business model comprises in-house development, in-house production and distribution of pharmaceuticals and other healthcare products for specifically targeted markets by a medical and pharmaceutical sales force. Dermapharm holds approximately 950 marketing authorizations (Arzneimittelzulassungen) for more than 250 active pharmaceutical ingredients, which are marketed as pharmaceuticals, dietary supplements or supplemental balanced diets. This assortment makes the company unique. In addition to Germany, the company’s core markets also include Austria and Switzerland. The company plans to further expand its international presence. Dermapharm’s business model also includes a parallel import business, which operates under the “axicorp” brand. Based on revenues, Dermapharm was among the top five parallel import companies in Germany in the first half-year 2018. With a consistent development strategy and numerous successful product and company acquisitions over the past 25 years, Dermapharm has continuously optimized its business and provided external growth impulses in addition to organic growth. Dermapharm intends to continue this profitable growth course in the future. The company is focusing on three strategic growth drivers: in-house development of new products, increase of its international footprint and further acquisitions. These include the acquisition of the pharmaceuticals manufacturer and distributor Trommsdorff in January 2018, whose portfolio includes the well-known brands Keltican® forte and Tromcardin® complex.